Implant treatment is recognized as the treatment of choice in replacing lost teeth. Because older methods of tooth replacement, such as bridges, partials, and dentures, have disadvantages in terms of both appearance and function, dental implants are better. Replacement teeth supported by dental implants have success rates higher than 90 percent in long-term function. 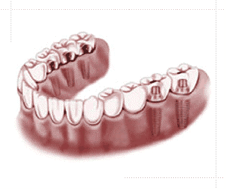 A dental implant is a small screw made of titanium, which is a metal that the body easily accepts. The dental implant is inserted into the jawbone and acts as a firm anchor for the replacement tooth. Your dentist will determine whether dental implants are right for you after an evaluation of your dental and medical history. Naturally, every patient presents unique conditions that can affect the outcome of a dental implant treatment, but taking proper care of the implants will help to ensure long-term success. Each situation has a slightly different process, but generally, we place the implant in the jaw using a gentle surgical procedure. Many patients claim that having a dental implant placed is less traumatic than having a natural tooth extracted. After the bone has bonded with the implant, the next step is to create a crown. In a few appointments, your dentist will attach a post (abutment) to the implant, take impressions of your teeth, and check for proper fit and color of the crown. When a single tooth is missing, the two most common treatment options are the older tooth-supported bridge and an implant-supported crown. When a traditional bridge is used to replace a missing tooth, the adjacent teeth are cut down to pegs in order to fit the cemented bridge in place. You end up needing multiple crowns to replace the destroyed teeth. This method of tooth replacement can be very esthetic and functional for a period of time. However, a tooth-supported bridge does not replace the bone that previously surrounded the root. Since there is no longer a root to hold the bone in place, the bone deteriorates, or melts away. When more than one tooth is missing, there are three common treatment options: a tooth-supported bridge, a removable partial denture, and an implant-supported bridge. In this situation the benefits of implant supported teeth are even more obvious. A removable prosthesis, such as a partial denture, actually accelerates the bone resorbtion process, resulting in more rapid bone deterioration. In addition, the clasps which hold the partial denture in place put extreme pressure on the natural teeth they hook onto, loosening them and in many cases, eventually leading to the loss of those teeth. Most patients with partial dentures state that they are uncomfortable and that they rarely wear them. Each situation has a slightly different process, but generally, we place a dental implant in the jaw using a gentle surgical procedure. (Many patients claim that having a dental implant inserted is less traumatic than having a natural tooth extracted.) After the bone has bonded with the implant, the next step is to create a crown. Your dentist takes care of that. In a few appointments, your dentist will attach a post (abutment) to the implant, take impressions of your teeth, and check for proper fit and color of the crown. 1. Place the Implant - With gum tissue opened to expose the area of bone, we use a special drill. Once the bone has been prepared, we can place the implant. 3. Attach the Post – We remove the cover screw and attach a special post (abutment) to the implant, which will support the new crown. 4. Deliver the Crown – We take impressions and place a temporary crown. After it’s constructed, the final crown fits over the abutment.